Social media – it’s all anyone seems to talk about these days. Or tweet about. In the last decade, social media usage among adults has jumped from 7% to 65% and has ultimately changed consumer behaviors in a major way. 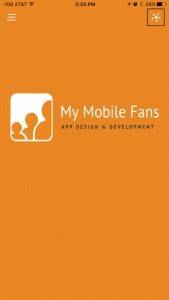 Users will be required to login to post any comment (Fan Wall or Contact) to your app. This discourages keyboard warriors from posting nasty comments as their social profile will be tied to their comment. This likewise will reduce the amount of spam comments your app will receive. Users will be able to share your app to their social sites to get you more downloads. There are also a few ways users can login to your app. First they can click their profile icon in the upper right hand corner of the homescreen to connect their profile to their social accounts. They will then be presented with their profile screen. 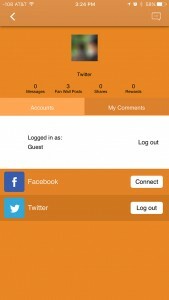 Inside the users profile, they can click the connect buttons to link their Facebook and Twitter social accounts to your app. This will allow the user the ability to post comments fluidly inside your app. The second way for users to connect their accounts is when the user wants to post a comment on your app. We have many native app functions that users can leave comments. When users click to leave a comment and haven’t linked their social properties, a screen will be displayed requiring the user to link their accounts in order to leave the comment. If you do not wish to have users leave comments in your app, you can add the Social Tab and click the Content tab. From there, just check the box “Hide Homescreen Widget”. This will remove the social profile from the homescreen. The next thing to do is to check the box “Disable commenting” in the publish section of your app before your app has been published.